Kolkata is a city that’s filled with a beautiful culture, people, and lifestyle. This is one place where you can live in peace and experience a high-end life of comfort. The real estate industry has grown over the years in Kolkata and has created good competition amongst several real estate companies in the market today. Arya Group and Rajwada Group is a renowned real estate giant that has created marvels that have impressed the hearts of many. They have merged to create their latest residential project, Arya Rajwada Sky. This is one extravagant development that offers the luxurious variant of 3BHK apartments that offer a modern-day lifestyle of peace and comfort. With apartment sizes starting at 1672 sq. ft. and going up to 1917 sq. ft., superior space is something that you can surely expect. You can choose the perfect apartment for you and your family without any hassles. If you’re looking for exclusive luxury, this is the place to be. The internal and external amenities at this development are simply awesome. From grand furnishings and fittings to vitrified flooring, wooden flooring in master bedroom, kitchen with granite top, premium doors and aluminum window framed windows, electrical power points at the right areas, The external amenities include a club, gym, swimming pool, sports facilities for different games, play zone for kids, landscape garden, community hall. This development also offers structured parking, intercom facility, CCTV security, water purification plant and power backup. Located at E.M Bypass, Arya Rajwada Sky Kolkata offers complete convenience to every place you need access to. 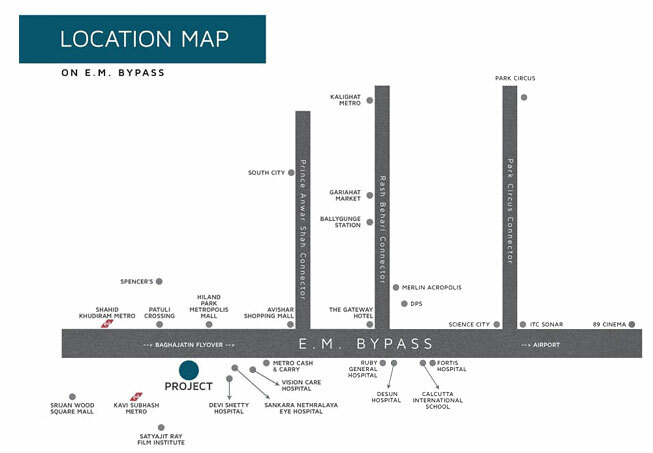 From schools to colleges, hospitals, medical centers, shopping centers, malls, restaurants, hypermarkets, banks, ATMs, public transport and roads to highways, you can find it all with ease, as this project comes in close proximity to all your everyday needs. 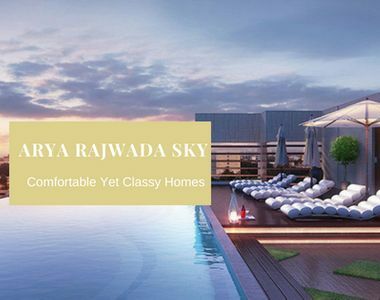 The Arya Rajwada Sky price starts Rs. 1.03 crs to 1.18 crs. This is one development that is high on comfort and low on price. Every apartment here is worth your savings to purchase a beautiful apartment with the ultimate comfort and luxury. You can choose from multiple payment options and also opt for home loans from different banks.